Fanatic! I hope October has been treating you well. I’ve been doing show after show and all is well. I’ve been getting in all the listening I can at the gym and before shows. I’ve been listening to a lot of Fall albums, which is always a good thing. In our first hour, we have a fantastic batch of tracks that I think comport very much with the mood of the month. For our second hour, I thought we would do something interesting for our last October show. 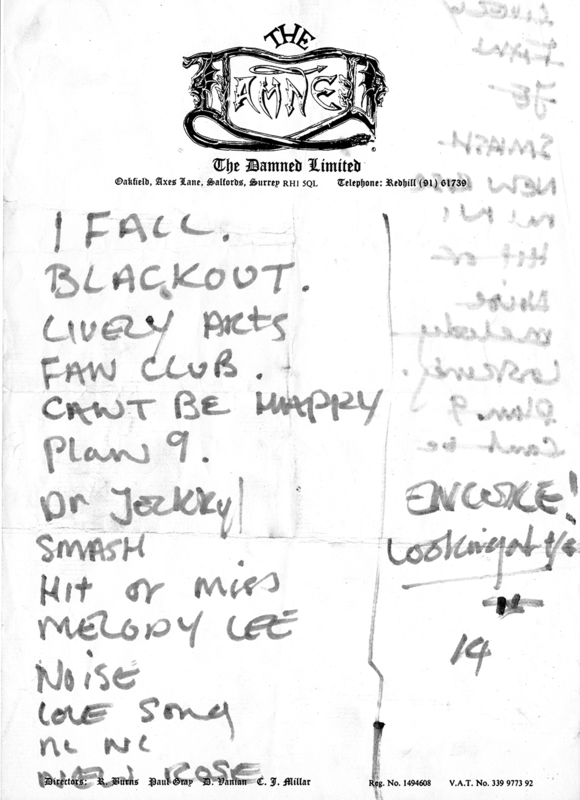 I came across this cool Damned set list from 04-19-81. I thought it would be cool if we played the set list but used alternate versions of the tracks to make it interesting. After the set list concludes, we encore with some other Damned tracks. Fanatic, we’re trying to keep the show as crafted as we possibly can. You deserve nothing less! Fanatic, we very much hope you dig the show. Until next week! Keep it spinning and STAY FANATIC!! !